by sponsoring a Canadian team member! GM Aman Hambleton came to Seneca Hill in 2012. Since then, he returned every time he was awarded a new FIDE title. We are so glad that he has become a grandmaster! GM Aman Hambleton is coming to Seneca Hill Chess again! GM Aman Hambleton is representing Canada at Chess Olympiad again! FM >> IM >> GM! The draw was done the past Sunday. Here are the winners! Winners will be reimbursed $65 after participating in the OCC 2018. On December 23, 2017, during our OCC qualifier 1, we gave out two awards to our National Chess Masters: Sean Lei and Harry Zhao! Both players have been part of our Seneca Hill chess for years. Sean achieved his National Master status back in February 2016! However, it took almost two years for CFC to have Sean’s name listed because they kept forgetting to do so. 🙂 Harry recently attained his title. We would like to thank Sean and Harry for supporting our tournaments. In order to recognize their achievements, we are happy to present them with a scholarship of $100 each. We hope that our students look to these role models and keep working hard! Next time, it may be your turn to become a chess master! We are moving our Saturday Chess Lessons and Training and Sunday tournaments to a nice new school from September 2017. Address: 25 Rochelle Crescent, North York, ON M2J 1Y3. From October 24 to November 6, I competed for Team Canada at the World Youth Chess Championships in Halkidiki, Greece. It was a very nice experience; I got to play some tough games of chess against representatives of countries all around the world! All the competitors were very strong and well prepared, but I still somehow managed to score 6 points out of 11 in the U14 Open section. The WYCC is a very costly trip, adding up to around $3000 per person. However, the two weeks of intense chess and a nice, sunny resort is well worth it. Every day, your assigned coach will prepare you for your game against your opponent by reviewing their openings and playstyle. After the game, they will analyze it and show key mistakes for both players. The World Youth Chess Championships is not only a rigorous tournament to compete in, but also a great learning experience to help improve your chess. If it can be afforded, I strongly recommend playing at the WYCC at least once in your life, in order to experience first hand how the world’s chess elites play the game. Lastly, I would like to thank Corinna Wan and the Seneca Hill Chess Club for sponsoring my trip to Greece! The financial aid was a great help in covering the travel expenses. I hope that one day, more players of the Seneca Hill Chess Club will become strong enough to play at the World Youth Chess Championships too! We raised a total of $673 for Harry, Benjamin, Jonathan and Angela to attend the World Youth Chess Championship in Greece and they have returned with greater knowledge of the chess world and Greece. These four members of the WYCC Canadian Team came to our Sunday Chess Tournament to talk about their chess and WYCC experience. They also helped out with the tournament, played in the tournament and gave the awards out. These players would be happy to follow their footsteps. We had 25 plus all the above 5 WYCC players showed up to our Fundraising tournament today. Some also played a double chess game against our WYCC Canada team members, Harry, Benjamin, Jonathan and Angela. Joey played a 8 board simul. We raised $325 today. The total is now $673! Please come have fun, as well as support our talented Canadian juniors on September 27. To register, please use the tournament registration here. We had 30 players showed up to our to our Fundraising tournament today. Some also played a double chess game against our WYCC Canada team members, Harry, Benjamin, Jonathan and Angela. We raised a total of $348 today. Please come have fun, as well as support our talented Canadian juniors on September 20 and 27. WYCC 2015 Fundraising for Seneca Hill Chess Club students. We are fundraising for our talented students who represent Canada in the WYCC 2015 in Porto Carras, Halkidiki, Greece from October 24 to November 6 2015. Angela Lin U8G, present Seneca Hill Chess Team member. First in OYCC and CYCC 2015, official Canadian representative. Jonathan Zhao U10, Seneca Hill Chess Club member. One of the top grade and age group players since grade 1. Benjamin Lin U12, present Seneca Hill Chess Team member. One of the top grade and age group players since grade 1. 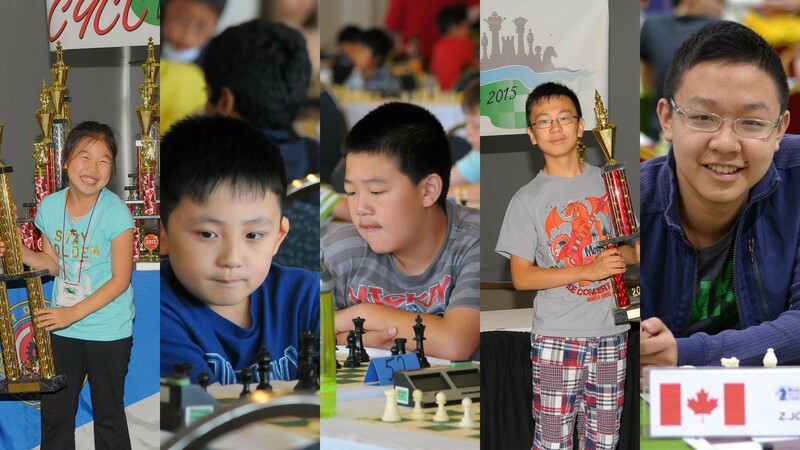 Harry Zhao U14, previous (graduated) Seneca Hill Chess Team member. Third in CYCC 2015. Joey Zhong U16, National Master, Previous (graduated) Seneca Hill Chess Team member. Our supply teacher. In three ways we are going to raise fund. (1) The GROSS income on September 13 and 20 will be contributed to the fund. (2) Play double chess with either Benjamin and Angela or Harry and Jonathan on September 13, 20 or 27. The fee is a Seneca Hill medal* or $3 per player per game. If you win, you get the medal back! *Any medal that has the Seneca Hill logo on it, in re-usable condition (you can keep the neck ribbon). We will donate $3 for each medal we receive. To make the above details short here: Bring a Seneca Hill medal or $3 to support our Seneca Hill Canadian representatives on September 13, 20 or /and 27 Sunday tournaments. Thank you! Registration: just register for the Sunday tournaments at link here.